Beckett isn’t easy at any age. In my misspent youth I found him impossible. But, seen through the lens of time, his recurrent themes of disappointment, despair, defeat and death resonate rather differently. And, face it, the man writes funny. While not quite reaching the heights of the author’s masterpiece “Waiting for Godot,” a double bill of “Endgame” and the brief, rarely-performed “Play” at ACT turned out to be an enjoyable evening of theater. The 1963 “Play” is a curtain-raiser in every sense of the term. Less than half an hour long, it has a cast of three, if you don’t count a hard-working spotlight (lighting by Alexander V. Nichols) that almost counts as a character in itself. Three characters are encased in urns (funeral?) with only their heads showing. The wife (René Augesen), the husband (Anthony Fusco) and the “other woman” (Annie Purcell) tell a triangular tale of infidelity — speaking individually as the spot hits them — or all together as it fades to black. Then, when they finish, they tell it all over again, only faster. Actually, this is not a bad thing as the poetic language bears repetition. It is as if they are stuck in an endless loop, which actually may be the case. Are they dead? Is this one of Dante’s nine circles of Hell, where they are doomed to talk this thing to death for all eternity? At one point the man likens the spotlight to an eye. Is it the eye of God? Doesn’t much matter. Under Carey Perloff’s crisp direction it is a beautifully orchestrated study in self-absorption, each character seeing themselves as the center of the universe, but only when the light hits them. Above all, it is hilariously funny and, because it is Beckett, inevitably tragic. But it is the second play that everyone has come to see because it stars two-time Tony winner and Bay Area favorite Bill Irwin. Irwin plays the lordly invalid Hamm who, with his hapless servant Clov (Nick Gabriel), lives in a tomb-like room with two high windows, one overlooking the sea, the other the land (scenic designer Daniel Ostling). 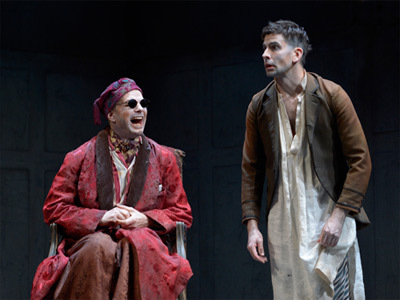 Although the stage is dominated by Hamm’s wheelchair and the action is dominated by the two verbally sparring men who can’t live with or without each other, they are not alone in the room. Stuffed into two garbage cans at the side are Hamm’s parents, Nagg and Nell, briefly but beautifully played by Giles Havergal and Barbara Oliver. They surface every now and then to comment and then are stuffed back down into the cans. As for the bad-tempered Hamm and the subservient but resentful Clov, it is as if they are Vladimir and Estragon of “Godot,” grown old and crabby and set in their ways, no longer waiting for anything but death to set them free. Irwin and Gabriel get it just right as they needle each other and mine every drop of humor from the dialogue. The only problem is that (sometimes like life) it just goes on too long. At 80 minutes, one begins glancing at one’s watch and waiting for “Endgame” to end already. Perhaps that’s just the metaphor intended by the playwright.